China’s solar thermal industry needs to adapt to changing demand by focusing on innovation and quality: That was the key message coming out of the annual association meeting titled Practicing new development concepts and adapting to high quality requirements. Held from 11 to 13 December 2018, the event kicked off with a speech by Zhang Xiaoli, Executive Director of the Rural Energy Industry Association, also known as CAREI, who said that the industry was still in the process of adjusting to new market conditions and giving fresh impetus to growth. In 2018, the annually installed collector area was again down. But although it dropped by 4.9 % to 35.54 million m², or 24.8 GWth, flat plate collector sales were on the rise, as was the share of the engineering segment. The sector is stable, and progress is being made. Structural adjustments are being perfected. The innovation atmosphere of the whole industry has taken initial shape. The diversification of the market is increasing. Low-price competition restricts the development of high-quality products. There are no quality inspections of large-scale solar installations. There is a lack of heating statistics and the implementation of space heating policies should be accelerated. The report consulting firm Sun’s Vision creates for the Solar Thermal Industry Federation (CSTIF) each year is a good starting point for exploring the fast-track transformation of China’s solar heat industry. 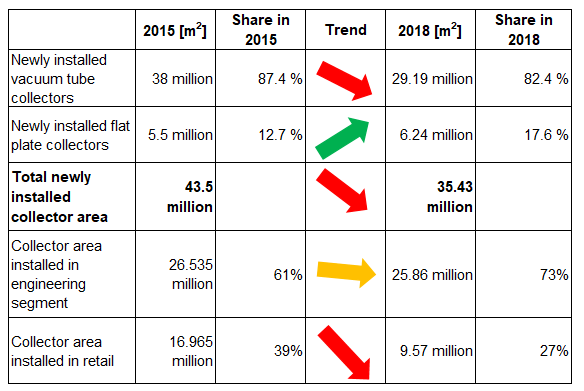 As seen in the table below, sales of flat plate collectors grew by 13.5 % between 2015 and 2018, from 5.5 million m² to 6.24 million m², even though the collector market as a whole shrunk by 18.6 %. The shift from residential buildings to the engineering segment, which includes solar hot water systems in multi-family, public and tourist buildings, is even larger. Sales of residential systems dropped by 44 % in the three-year period considered in the report, while the engineering segment has been almost stable, shrinking by as little as 2 %. A side-by-side comparison of 2015 and 2018 figures will reveal a notable increase in flat plate collector sales despite a strongly declining residential market. You find the 2015 figures here. Obviously, these trends are prompting big changes in the industry, with businesses shutting down or lowering production output. However, there is growing interest in commercial solar thermal projects. CSTIF said solar space heating in public buildings, as well as other countryside structures, in northern China was quickly gaining in popularity, as was solar heating and cooling at government property. In addition, there had been a rising number of solar thermal demonstration plants in the industrial and agricultural sector. This article is based on a news piece about the industry meeting (see http://wemedia.ifeng.com/92672087/wemedia.shtml) and a presentation that Sun´s Vision gave on its market report. The article was written jointly with Yaping Zhang, an expert in solar thermal technology and a member of solrico’s partner network.